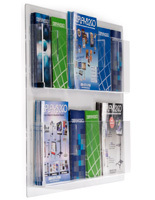 What separates acrylic magazine racks from other plastic constructions? 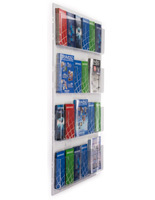 Our wall mounted literature displays are made from high impact polymerized plastic material that offers superior strength and resistance to breakage as well as perfect visibility. 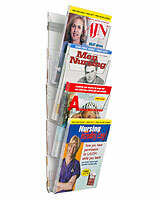 Clear acrylic magazine racks are ideal for use in public areas with heavy traffic, making them especially well-suited for use in waiting rooms, lobbies or office environments. 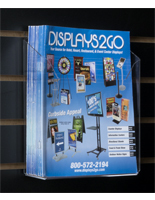 In addition, hanging displays are a simple solution to limited floor space and allow full visibility and access to contents while maintaining an organized environment. 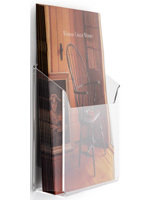 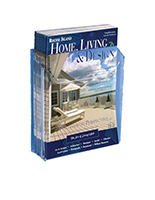 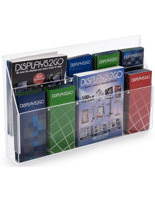 Exterior-rated clear acrylic magazine racks, sometimes called professional-grade plastic literature pockets, are a great choice for keeping brochures and catalogs safe while stored outside. 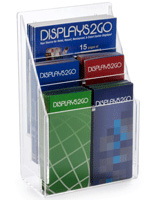 Modular hanging displays are designed for office or lobby use and can feature anywhere from a single pocket to 32 separate bins. 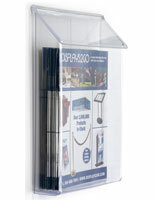 Adjustable-width fixtures use simple dividers to allow each container to securely hold materials in a variety of sizes. 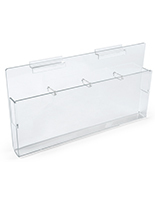 This type of lightweight, space-saving holder is a perfect choice for institutional, commercial and hospitality environments. 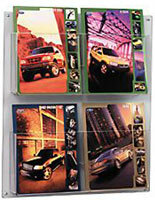 What size materials can plastic literature pockets accommodate? 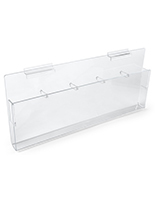 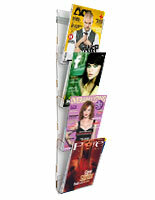 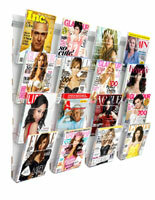 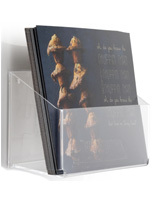 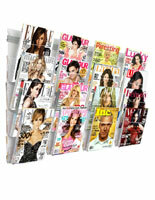 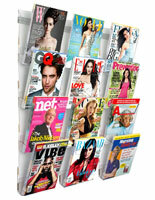 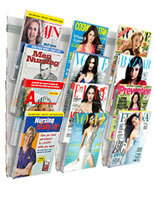 Acrylic magazine racks are designed to hold media up to 8.5" wide. 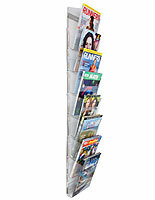 Traditional monthly periodicals and journals fit easily into the roomy bins. 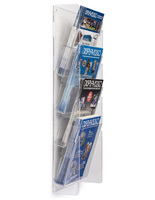 This size holder is an ideal choice for business use, as the clear displays can be used to showcase printed collateral in sales environments, reading material in waiting rooms or simply store files in offices. 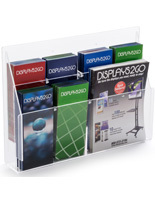 This is the most common width fixture, as it can utilize adjustable dividers to easily transform from a magazine rack to a pamphlet or catalog-size display, allowing a single container to be used for periodicals, brochures and catalogs alike. 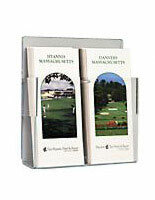 Wall mounted plastic literature pockets designed for brochures feature a narrower width to securely hold standard 4" x 9" trifold literature. 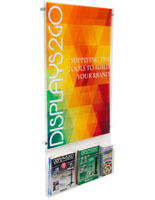 This size holder is often capable of being both wall mounted or used as a countertop fixture, making it a superior choice for office or trade show use. 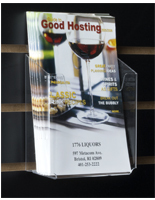 In addition, many businesses, such as real estate or travel agencies, need customer-accessible take-away literature in outdoor locations. 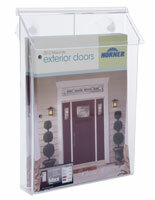 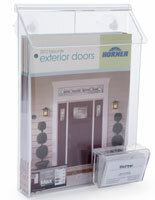 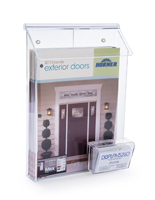 Durable clear plastic literature pockets with lids are perfect for exterior installation and keep collateral displays protected from the elements without impeding accessibility. 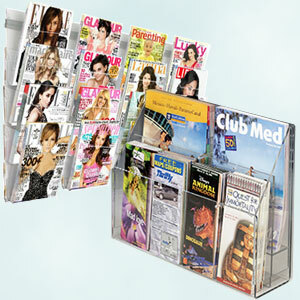 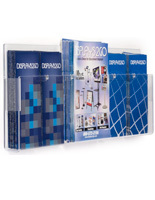 Traditional "catalog-size" acrylic magazine holders are designed for printed materials up to 5.5" wide. 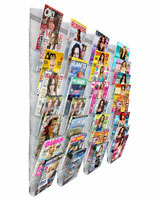 Often used in business or office locations, these racks can be wall mounted indoors or outdoors, depending on their design. 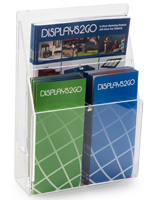 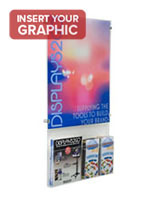 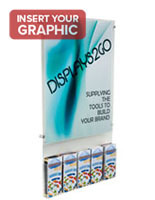 Commercial literature displays such as brochures and catalogs need to be easily accessible by customers as well as offering high visibility and stability. 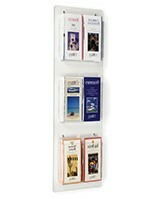 Narrower than standard magazine racks, smaller hanging fixtures keep printed materials organized and tidy. 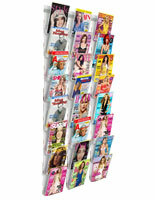 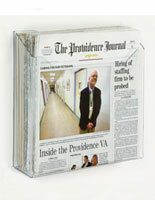 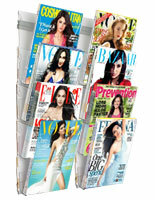 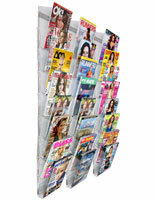 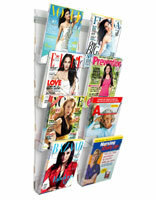 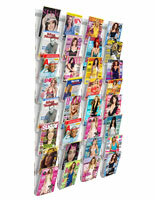 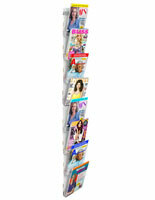 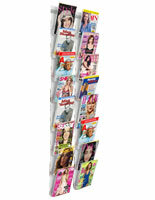 At 14" in width, tabloid or newspaper-size acrylic magazine holders are the widest racks. 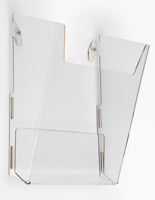 This size display is also frequently used with adjustable divider pins, allowing the acrylic magazine holders to hold support a wide range of configurations. 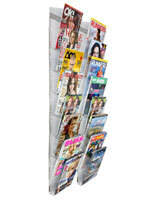 Wall racks allow waiting rooms to offer daily news to patrons or clients without creating messy counter or table top areas. 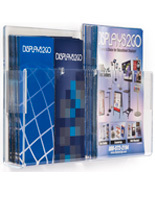 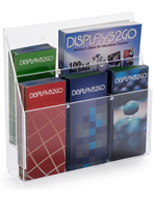 High impact plastic displays are designed to keep periodicals, brochures and catalogs organized in a variety of different professional and commercial environments. 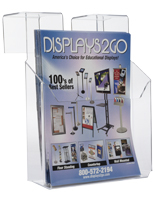 Offices, schools, organizations, service or hospitality businesses and more utilize this type of holder anywhere from a waiting room to a trade show booth to outdoors. 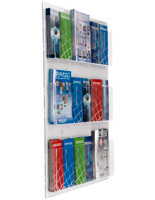 Economical wall mounted plastic racks not only save counter or floor space, they are an ideal way to store and organize printed materials without sacrificing visibility.